I don't eat peanuts or peanut butter very often, but every so often I get a craving that only peanut butter frosting (or filling) will fix. Unfortunately, with my dietary needs, most frosting recipes will not work for me. This heavenly concoction doesn't have: powdered sugar (or the included cornstarch) or refined sugar. Which means I can eat it. By the spoonful. Mr. Magpie and I invented this particular frosting to be used on a special, dairy-free, friend's birthday cupcakes, which meant creating a frosting without butter. Not an easy challenge, but I think this works quite well. The trick, of course, to working with coconut oil is to get it to the consistency you want. Since it melts at body temperature, it has a tendency to liquify if you work it too much. So you have to use just a bit and work quickly. Coconut oil is really chunky out of the jar, but a quick trip in a bowl with a fork to cream it brings it to a nice consistency. Here's a picture showing regular coconut oil on the left, and creamed coconut oil on the right. After that it's just a matter of stirring in the rest of the ingredients (peanut butter, honey and a pinch of salt) with a spoon. You can adjust the honey amount up or down to account for your taste for sweetness, which is very personal. Mr. Magpie thinks it could use more honey, I think it could use less, so this was our compromise. You may find that the coconut oil wants to melt from the stirring (or if you are using freshly ground peanut butter that is still warm) and you will likely need to refrigerate the frosting for an hour or two before using it. Or, you can add some coconut milk to thin it out and make more of a glaze. 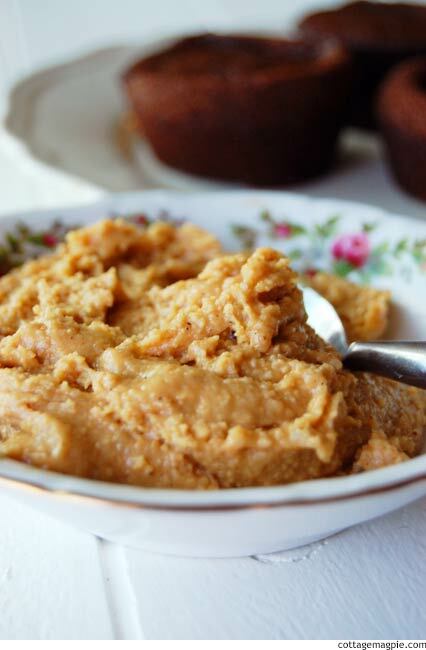 Peanut butter frosting for those on dairy-, corn- and gluten-free diets. This batch of frosting makes enough to frost 12 regular sized cupcakes. Use a fork to cream the coconut oil and bring it to a frosting-like consistency. Stir in the remaining ingredients. Note that the salt is only required if the peanut butter is unsalted. If you are desiring a thick, spreadable frosting, place the frosting in the refrigerator for 1-2 hours to cool it down and harden the oils. If, on the other hand, you are desiring a thin, pourable frosting or glaze, add a few tablespoons of coconut milk to thin it out. I hope you enjoy it!! If you try it out, let me know how it works for you!